Gainesville is filled with countless opportunities for outdoor activities. Relax by our saltwater pool, explore parks, swim in the natural springs, and more. Embrace the outdoor lifestyle of Florida by pedaling one of these Gainesville, FL, bike trails! Discover the beautiful landscape around Sweetwater Branch Inn when you wander through any of these Gainesville, FL, bike trails. You can learn more about the outdoor activities to enjoy during your trip when you access our complimentary Vacation Guide! This list of handpicked, local recommendations has helped countless travelers to plan the getaway of a lifetime, so get your free copy today! The Gainesville-Hawthorne Trail spans for more than 16 miles. Bicyclists love the paved pathway, and because it starts in Gainesville, it is easily accessible! It travels through expansive conservation lands such as Paynes Prairie State Preserve, another favorite biking spot. It’s the perfect place to discover all the natural beauty Florida has to offer. Designated as a National Natural Landmark, we can assure you that you have never seen anything like Paynes Prairie State Preserve! Here, alligators, bison, horses, birds, and more all live in harmony amongst gorgeous scenery. We recommend starting your visit at the 50-foot-tall observation tower at the Visitor Center, then hopping on your bike to explore! If you’re looking for a little off-road biking adventure, try San Felasco Hammock Preserve State Park. While you can’t pedal through the entire park, the northern side is designated to both cycling and horseback riding. Each trail is well-marked and ranges from beginner to advanced. Experience steep drops, strong climbs, and even log crossings! 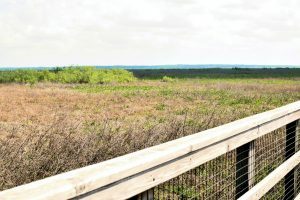 The Archer Braid Trail currently stretches for 6 miles between Archer and Gainesville, but it will soon be expanded to go all the way to the University of Florida. The trail is paved and smooth, so it is perfect for those looking for a nice ride. Don’t have a bike? Don’t worry! Our Downtown Gainesville Bike Ride Add-On will provide you with a bike, picnic lunch, snack, water bottle, and a map of our favorite places to explore. 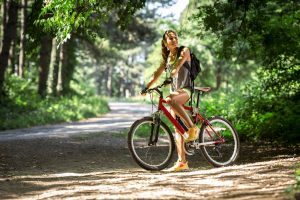 Whether you’re looking for a leisurely pedal downtown or a trek through some Gainesville, FL, bike trails, don’t let not having a bike get in your way! Enjoy your cycling adventure around Gainesville, then come back and relax at Sweetwater Branch Inn. Cool off by taking a dip in our saltwater pool, or opt for one of our rooms with a tub so you can soak and relax. Our historic property features cozy accommodations, beautiful grounds, and a homemade breakfast to start your day off right! We’re just a short distance away from Gainesville, FL, bike trails, shopping, restaurants, and more. Book your stay and start planning today!